The holidays are fast approaching. Many families enjoy this time of year with each other snuggled side by side amidst the love and warmth of their closeness. Part of most family traditions during the holidays involves experiencing the comforting crackle of a wood fire coming from their fireplace. What if you could bask in this toasty glow underneath the Texas sky? This fall season may be the time for that outdoor home remodeling project that you have been thinking about doing for some time. A beautifully crafted outdoor fireplace would allow you and your loved ones this holiday season to be surrounded by the glow and warmth of the fireplace in addition to the shine of the stars. Imagine warm cocoas and hot ciders cupped with grateful hands nestled next to each other and sharing bouts of laughter. All of this in the great landscape of a brick fashioned fireplace amidst the Texas sky. Unsure about whether or not an outdoor fireplace is for you? Let’s talk about some benefits for you and your household by adding such a piece to your home. In Texas, we have the wonderful privilege of participating in the splendid seasons of spring, summer, and fall. We enjoy the outdoors when the breeze is mild, skies are blue, and the temperature is great for sweet tea sipping. However, if you invest in a home remodeling project this fall, you and your loved ones will also enjoy this family space during a season of cooler weather which would normally not be as pleasant. By providing your home with this lovely addition, you will have the opportunity to create new memories and holiday traditions. The day is over and you can set aside the worries of work and care taking. The air is still and crisp. Night has been drawn and dusk is beginning to settle. Cuddle up near your outside fireplace with a good read, good drink, and a good rest. The simplistic picturesque display of the flames sparking and dancing in tune with the calming sound of the crackle soothes the mind and allows one to rest easy in the meek moment. Having an outdoor fireplace gives you the place and time you need to get the relaxation you deserve. With this wonderful new addition to your home, the possibilities are endless when it comes to entertaining. The outdoor space becomes a viable place for a greater amount of loved ones. You are now able to host an array of events in addition to the holiday traditions your family adores. Celebrations like winter birthdays and anniversaries may be kept to a minimum due to the lack of space or cost of indoor venues. 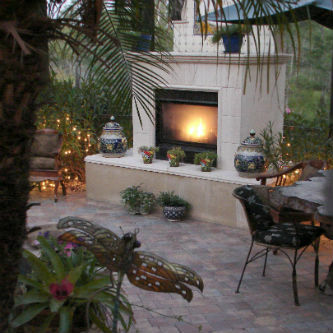 With an outdoor fireplace home remodel your home is the place to be to be jovial and festive. Investing in an outdoor kitchen, or an outdoor fireplace for you home will provide you with great benefits including year round outdoor space usage, a designated rest and relaxation spot, and the opportunities to be the life of the party. The time for a home remodeling project this fall is now! Start the process soon to appreciating this outdoor space by the time the holiday season is in full swing. Spend time unwinding this holiday outside surround by the Texas sky and loved ones. Utilize this home addition to you full advantage and distress from the tension and tiredness of holiday hustle and bustle. Contact us with questions and quotes today! We would love to hear from you!